Back when I was in the fifth grade, I encountered a fearsome looking character known as Wolverine. I had seen him before, but knew very little about him. That changed when a classmate brought a trade paperback to school that bore his name as its title. It collected all four issues of the classic limited series by Chris Claremont and Frank Miller into a single volume. The cover art was absolutely beautiful, or so I thought at the tender age of 10. It depicted the title character tussling with a group of ninja. The shadow warriors clearly had their hands full, as it looked like they were trying to restrain a rabid pitbull. Wolverine even had a length of chain clamped between his teeth. That which separates man from beast would feature prominently in the story, but I was much too young to truly understand such themes. All I knew was that I had to read that book. Read it I did, and I absolutely loved it. To this day that cover image remains seared on my psyche. It’s the defining image of the character as far as I’m concerned. 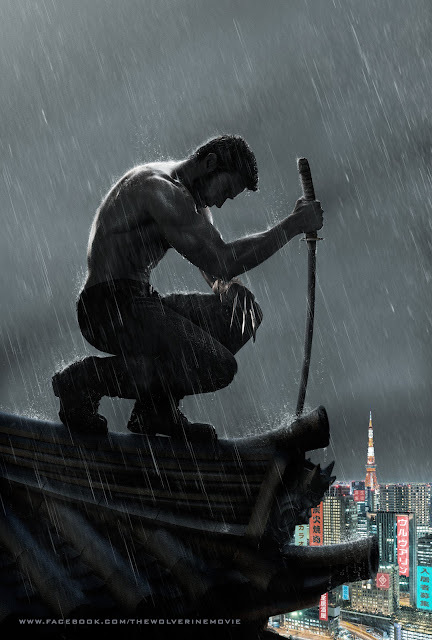 The new “motion poster” for the upcoming sequel The Wolverine tries for something equally as memorable, by showing a totally different side of the character. The poster features a shirtless Logan, standing on a rooftop high above Tokyo. He is perched directly atop a gargoyle, and crouching before a katana. The claws on his left hand are bared. The vibe I get is that he is in deep meditation, presumably before battle. Whatever the context, this image looks as though it comes from something ten times more interesting than 2009’s execrable X-Men Origins: Wolverine. Actually, it has no choice but to be better, considering the source material. It’s an adaptation of the aforementioned limited series, which places the world’s scrappiest mutant in the land of the rising sun. While my expectations for the film are below sea level thanks to its immediate predecessor, both the source material and this poster have stoked my interest. After all, a Wolverine movie set in Japan is as close to a "can’t miss" proposition as this franchise will ever get.